“Do as I say, not as I do,” is the message Coun. Richard Berry presents to the good citizens of Fort Erie. That’s what a dictator does. He dictates law. But when the law gets in his way, he ignores it. Does Richard Berry think he is the Town? 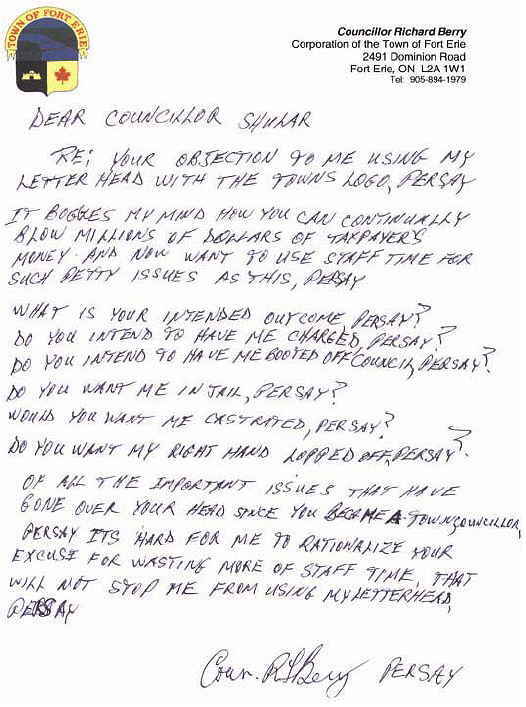 It is not difficult to imagine the uproar Berry would create if another councillor — in a serious and incomprehensible lapse of judgment — used a hacked copy of the Town’s logo to write a secret letter to an agency of a foreign government. He wrote the U.S. Federal Highways Authority Jan. 3 to state his opinion that the Town has been ill-informed on Peace Bridge issues and to request copies of correspondence between it and the bridge authority be sent to the mayor and council. Councillors were informed by the Peace Bridge Authority and discussion ensued at the Jan. 30 meeting. In a subsequent letter to Coun. Rick Shular (printed on the facing page), Berry presents us with some compelling options and a glimpse of his inner workings. He asks if he should be “booted off council,” jailed, castrated or have his right hand amputated. Other letters on the same coloured letterhead were delivered to the mayor and the clerk prior to the start of the Feb. 6 council meeting. Each contained unique content, but neither recipient would provide copies. His opinion as to the disposition of taxpayer money is his and he has his right to it. However, his penchant for exaggeration is disingenuous and unsettling when some people are willing to accept his claims as fact. Monster or not, it’s only a $250,000 one. Also on the issue of the CGDC, Berry fails to connect some dots regarding his call for a forensic audit of the Fort Erie Native Friendship Centre. The misuse of funds found in a bingo policy compliance audit occurred prior to the creation of the CGDC when a Town lottery licencing officer oversaw compliance. Yet, Berry calls for a return to the flawed system. The Town spent $17,000 on the audit to tell us the system prior to 2000 was broken. It’s difficult to estimate how much staff time was spent preparing reports and letters on that matter. It is well worth the effort to examine the things Berry says and to compare them to what he does to more fully understand that his principles are ever-changing to suit his opinion. Perhaps his only principle is if the mayor likes it, Berry doesn’t. “Of all the important issues that have gone over your head since you became a town councillor, persay, it’s hard for me to rationalize your excuse for wasting more of staff time. That will not stop me from using my letterhead, persay,” he wrote. Shular is as well informed about Town issues as anyone and more than some, and when he doesn’t understand, he seeks to find out before he fires off an opinion. One example was his inquiry about the Town policy for using letterhead when Berry’s letter to the FHWA came to light. He knows it is wrong in principle and wanted to know if there existed a policy about unauthorized use of the Town’s logo. If anyone doubts it is wrong, go ahead and try it. Scan a logo and write a letter. Some suggestions include the Niagara Regional Police logo, or perhaps a local lawyer to help drum up business. Perhaps you could try the logo of your employer or the volunteer board you sit on.